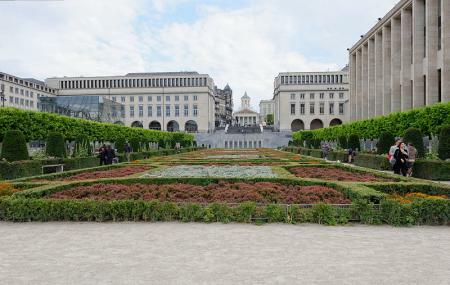 Mont Des Arts is a site of great historic importance in Brussels and has an interesting story behind it. The site used to be very crowded, but King Leopold II bought the neighborhood and decided to completely redo it. He had all the old buildings demolished. Then he had a temporary Park installed which was well appreciated by everybody. And then some decades later that Park was torn down to make way for some impressive and regal looking buildings around the square. All turned out well though. This place, thanks to its elevation, now has one of the finest views of Brussels. On a clear day you can see as far as the Atomium. Have a look at the beautiful formal garden right in front of the square. Twin rows of trees lead down an avenue to a large fountain that shoots jets of water. You will find lots of people sitting on the stairs to the garden and kids skateboarding. Also, visit the popular attractions in the city by following Brussels itinerary 3 days. How popular is Mont Des Arts? People normally club together Theatre Royal De Toone and Horta Museum while planning their visit to Mont Des Arts. One of my most adored spots in Brussels. Get a fine view on the city centre right smack in the middle of the historic centre. I love this little corner of Brussels. It's close to the main square, but it's where everybody hangs out on a sunny weekend. You'll get skateborders, bikers, artists, dancers rehearsing. It is a great place to chill, but also get some excitement. Mont des Arts it is a really beautiful place, it totally free and you can get aesily and if you travel to Brussels you have go there it is one of the main attractions. Also there are Local Guides around there giving free tours of the cities (just give a tip). Nice place. I love the view of the tower in grand place from Mont Des Arts at night. The cathedral on the other side looks grand too. During summers, the garden looks great. When its dark, the place is not that safe.